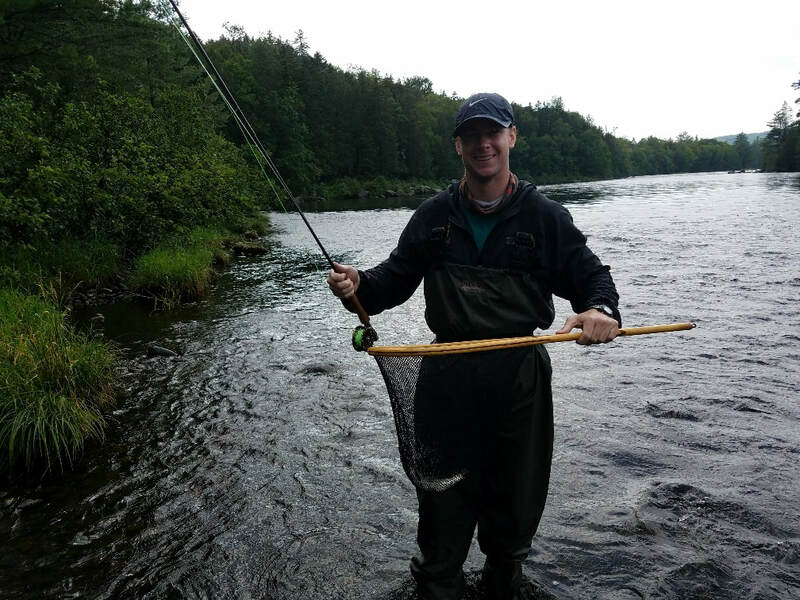 One of the places we love to fish is the West Branch of the Penobscot River, a terrific brook trout and landlocked salmon river. 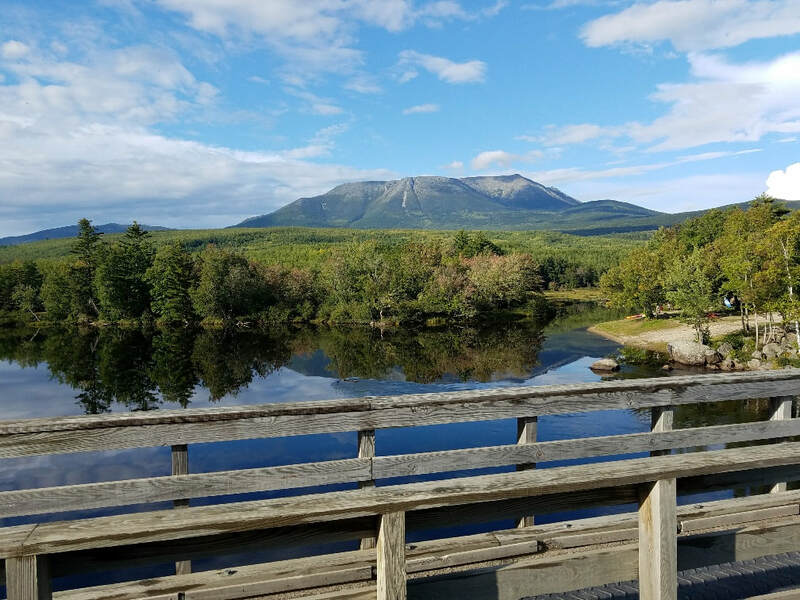 Less than two hours from Bangor, Maine, it is an easy, beautiful ride with majestic views of Mt. Katahdin. Wildlife abounds in this area and is not unusual to see a moose in one of the many lakes and ponds on the way up. 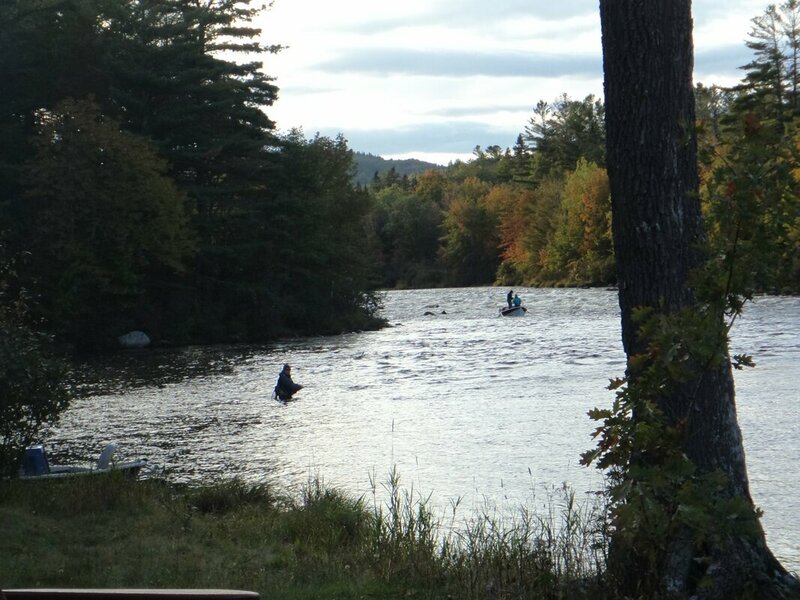 You can do a day trip, or camp out at the Big Eddy campground, Abol Bridge Campground, or stay at one of the many sporting camps in the area. The part of the river we fish is a 6 mile stretch from the Power station at Ripogenus Dam to the Nesowadnehunk Deadwater. There is easy access to the river as the famous (or infamous) Golden road parallels the river, with pullouts at some of the more popular spots. There are a lot of sights to see including Ripogenus Gorge, the Dam itself, and the Cribworks, to name a few. 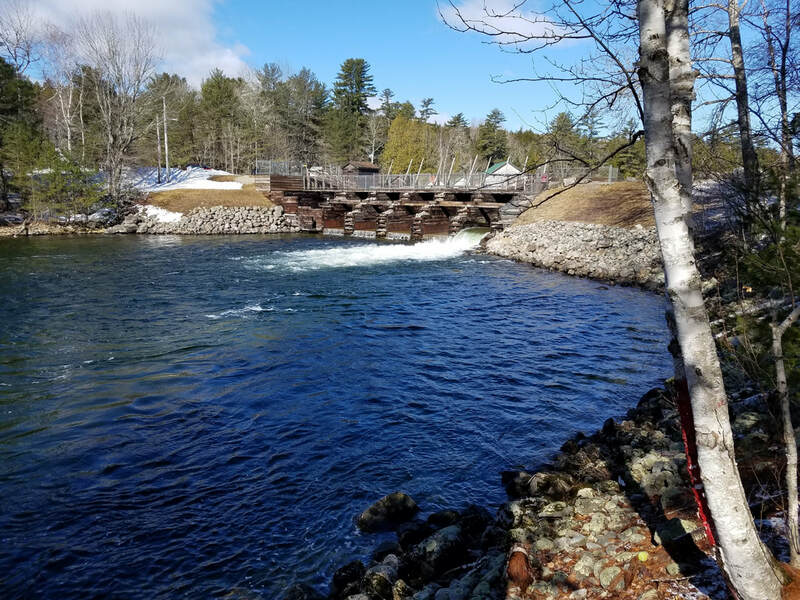 If you are coming to Maine to fish, this river needs to be added to your list! 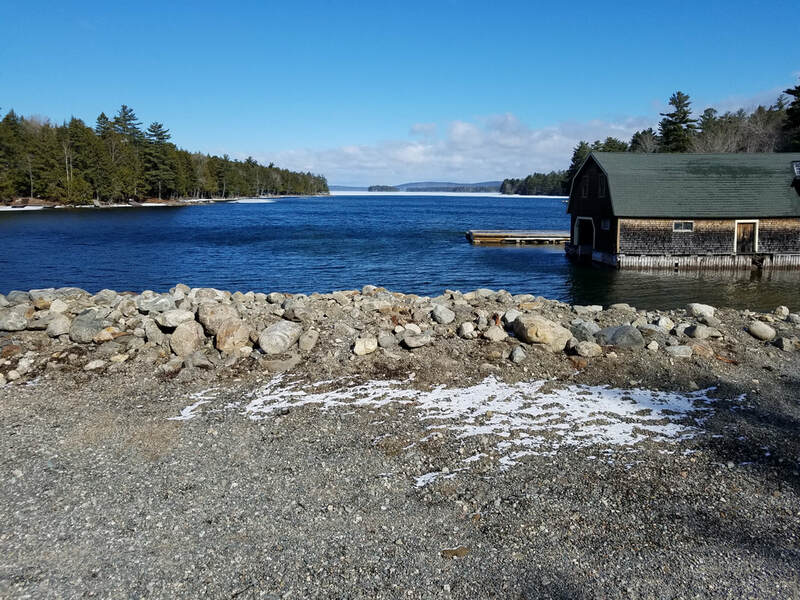 Soon after ice out, as the waters warm in the various lakes in Maine, the smelt (favorite food of trout and especially LL salmon) come out of the depths of the lake to spawn near inlets and outlets in shallower water. The LL salmon and trout come out of the depths of the lake to voraciously feed on them. This is a great time of year to troll smelt imitation streamer flies (a Black Ghost pictured below, is just one of hundreds of variations) with 7 - 9 wt fly rods. 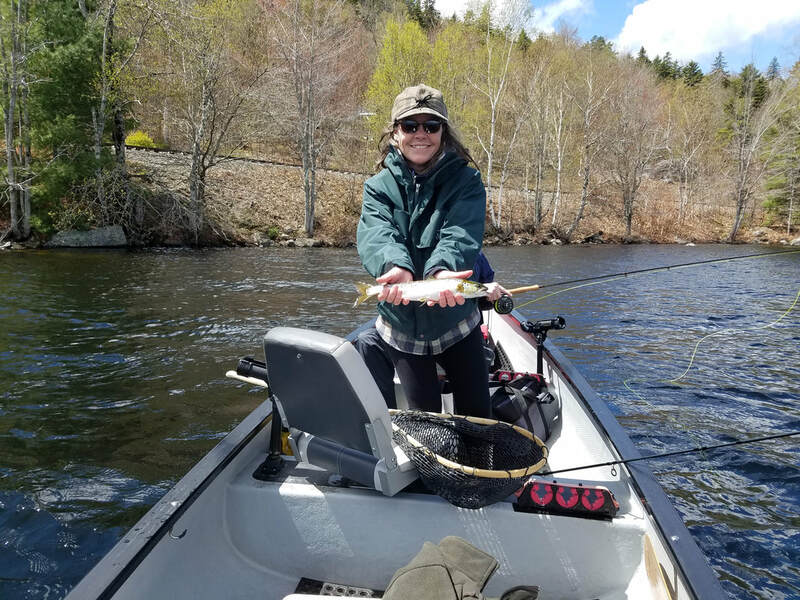 The challenge is finding the right fly, the right depth, the right speed, as well as the right weather conditions (cloudy days with a bit of a breeze, or "salmon" chop is considered ideal). 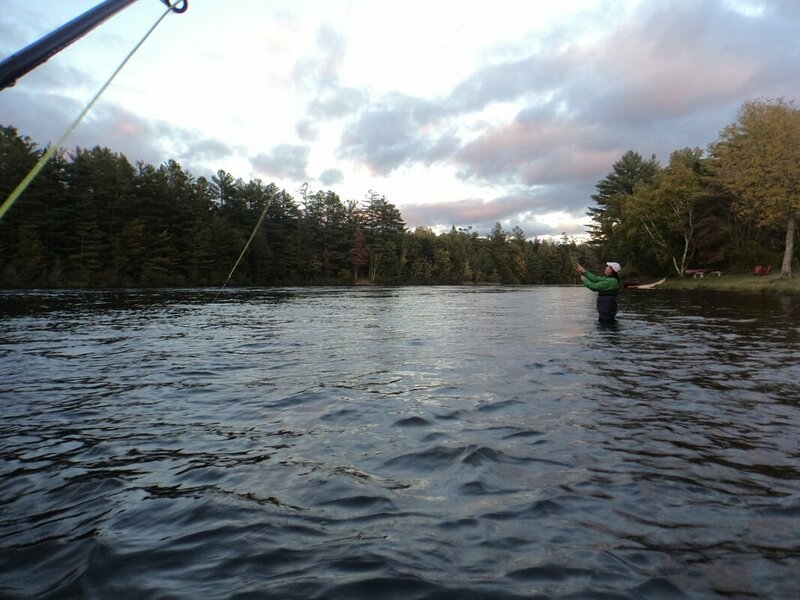 This is great fun, and watching springtime literally explode in Maine as you drive around these beautiful lakes is a great way to get back out on the water. Water temps are just above freezing, so dress accordingly. Gloves, hats, and multiple layers including rain gear is the order of the day. 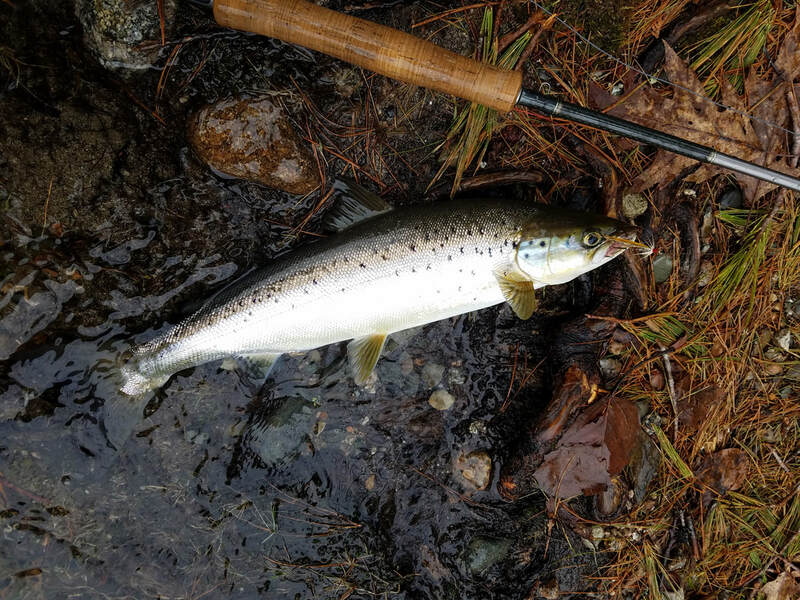 Two great references for more detail on all aspects of this traditional Maine pastime is Bob Leeman's book "Trolling Flies for Trout & Salmon" , and "Streamer Fly Tying and Fishing" by Joseph D. Bates, jr. Give us a call if you want to learn more. It's become an annual tradition. 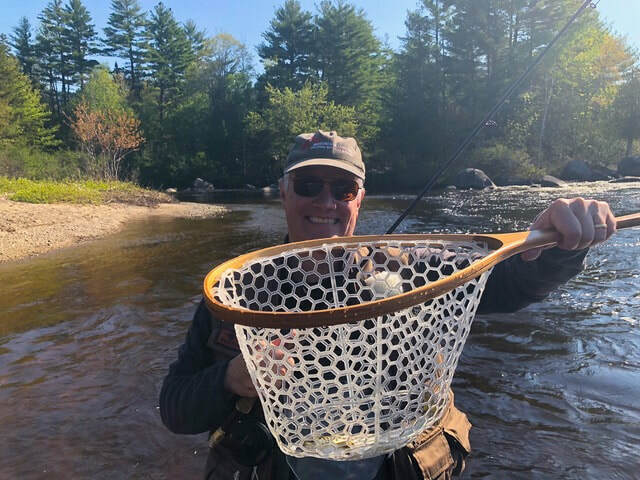 Every year I fish the gin clear waters of Grand Lake Stream on 1 April, which is opening day for open water fishing in Maine. 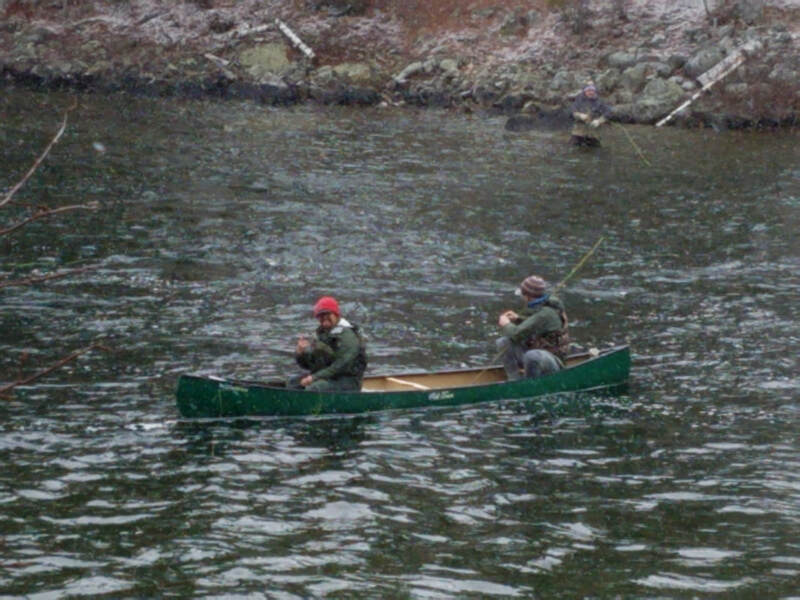 There are lots of places to fish year round in Maine, but I like the idea of an opening day as a sort of "winter is on it's way out" date. Opening day at Grand Lake Stream this year fell on a Monday. It was good to get all my gear packed and head out to Canalside Cabins for my annual trek. Canalside Cabins, owned my John and Mary Arcaro, are open year round, and cater to ice fisherman and snowmobiles in the winter. 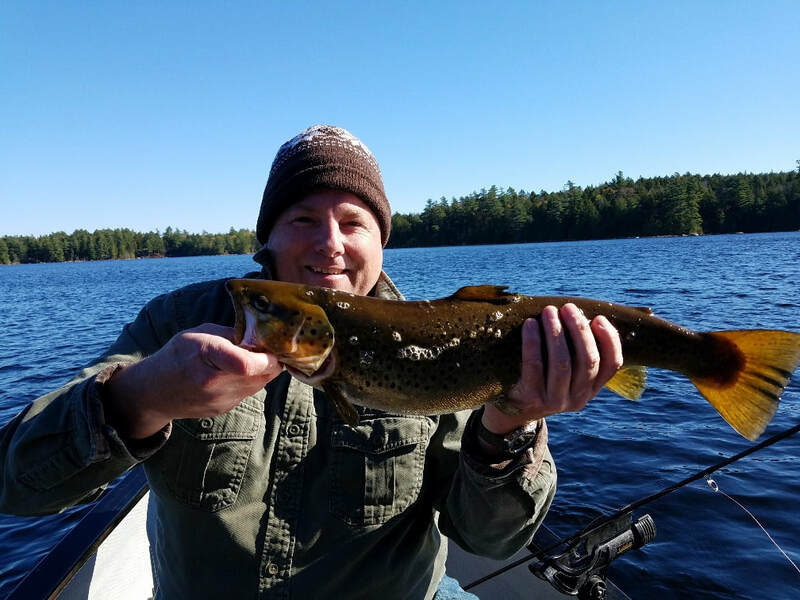 Friendly as only Mainers can be, John is always good for the latest fishing reports. Monday morning brought snow, cloudy skies, and 30 mph winds, which lasted all day. 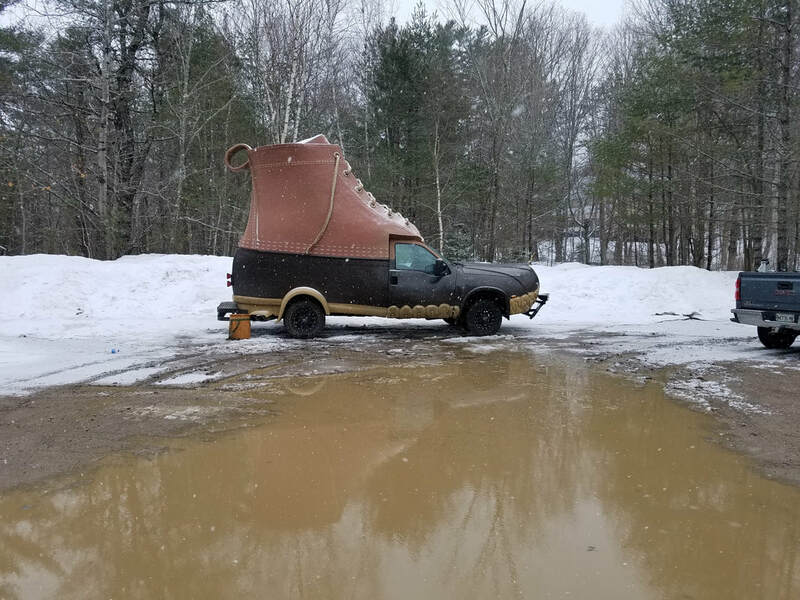 It was good to see the return of the "Bean Boot" to Grand Lake Stream for the season opener. I saw one guy anchored out in the dam pool in a pontoon boat catch several fish at daybreak, but that was it. There was also two guys in a canoe! No one else was catching fish, not even seeing fish, which is very unusual. Water flow was low (300 and some change). I'm sure some folks did, but I did not see them. Several Hours later the sun came out, which made for a beautiful day, though water temps and wind chased me back to the Pine Tree store for some home made chili. 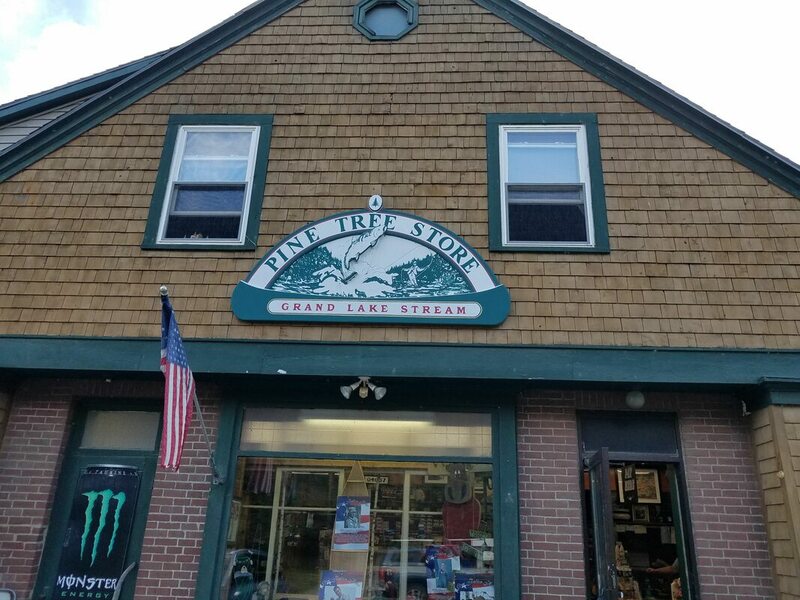 I love the Pine Tree Store as it has a little bit of everything - flies, groceries, a great little diner inside with great food, and friendly service. Also a great place to gather the latest fishing intelligence reports! I plan on heading out in mid-April to get on the scoreboard and do some recon for some guiding trips I will be doing in early May. As you can see in the photo of West Grand Lake, there is still lots of ice. We will be doing some spring trolling for land-locked salmon coming soon as the fish come out of the depths of the lake to chase spawning smelt, their favorite food. Stay tuned for more upcoming adventures! 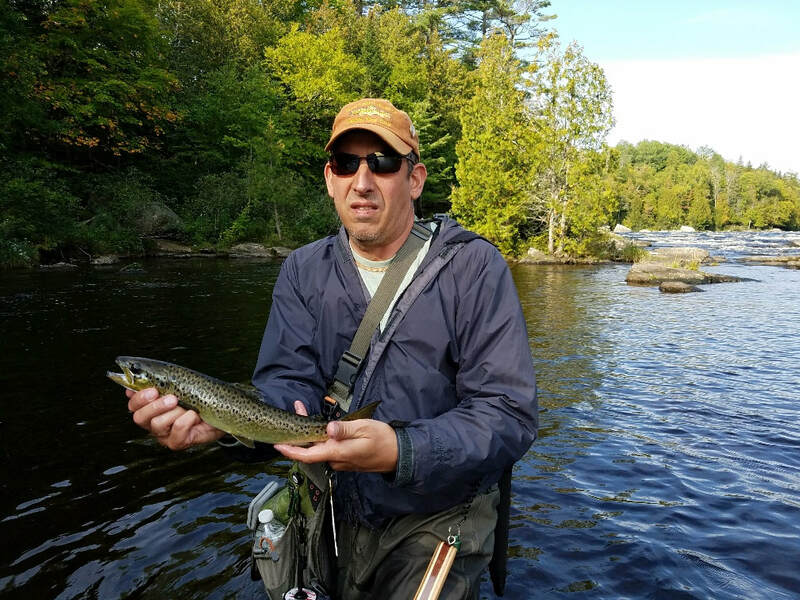 Mike Hegarty is an avid, lifelong outdoorsman who loves to share his passion of fly fishing, bird dogs, and upland hunting. After 40 years of active duty in the United States Navy, he now owns and operates Chick Hill Guide Service.